Sysprep was not able to validate your Windows installation. Review the log file at %windir%\system32\Sysprep\panther\setupact.log for details. After resolving the issue use Sysprep to validate your installation again. 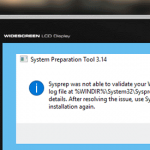 How to Fix Sysprep Was Not Able to Validate Your Windows Installation Error? In order to fix the error Sysprep was not able to validate your Windows installation go to the C:\Windows\System32\Sysprep\Panther directory and open the sysprep utility log file (setupact.log) using any text editor (for example, Notepad). Start viewing the contents of the setupact.log file from the bottom to the top and look for the errors. Depending on the error found, you will need to perform certain actions to fix it. Below we will consider the possible Sysprep errors. Error SYSPRP Package SomeAppName_1.2.3.500_x64__8we4y23f8b4ws was installed for a user, but not provisioned for all users. This package will not function properly in the sysprep image. This means that you manually installed Modern/Universal Apps from the Windows Store, or incorrectly uninstalled a certain app. In addition, to ensure that the Microsoft Store doesn’t update the apps from Microsoft Store, you must disable Internet access on your reference Windows 10 computer and disable automatic updates in the audit mode before creating the image. Also delete all local user profiles, only the local administrator profile should remain. Error [0x0f0036] SYSPRP spopk.dll:: Sysprep will not run on an upgraded OS. You can only run Sysprep on a custom (clean) install version of Windows. Then go to the key HKEY_LOCAL_MACHINE\SYSTEM\Setup\Status\SysprepStatus and change the parameter of the CleanupState key to 7. This will cause Sysprep to assume that this copy of Windows is installed in a clean install mode. Restart the computer and run Sysprep again.